I know I just posted a pumpkin muffin recipe and several other pumpkin recipes within the last month, but I just can’t stop. I love pumpkin. I honestly was going to call it quits for awhile, but on Saturday morning I was eating my pumpkin granola for breakfast and an idea popped in my head to make pumpkin chocolate chip granola bars. I quickly got out the pumpkin and started baking. I based the recipe off of my pumpkin granola, but I made a few changes. I adjusted the spices, used honey instead of maple syrup, and added in chocolate chips. This was my first time making homemade granola bars so I was a little worried, but after a few minutes in the oven, I knew they would be good. The smell of pumpkin and chocolate was divine. When the bars were golden brown, I removed them from the oven and let them cool for five minutes. I cut them into bars and let them finish cooling while we went to the farmers market. When we got home, we rushed into the kitchen to sample the granola bars. I sampled them again and again:) I was smitten. The chewy granola bars have a nice pumpkin flavor that is complimented by chocolate and laced with cinnamon and nutmeg. Homemade granola bars are so easy to make, I can’t believe it has taken me this long to try them. 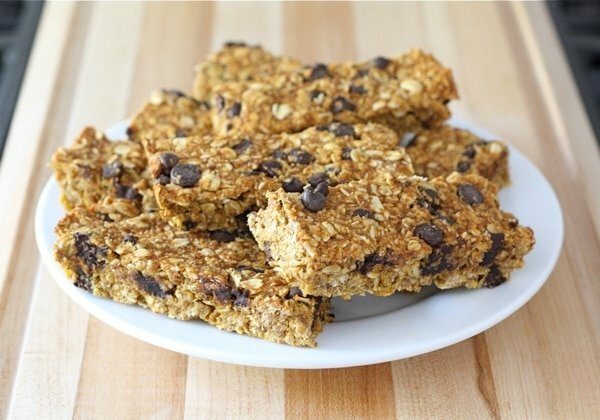 These pumpkin chocolate chip granola bars make a great fall snack or breakfast on the go. If you are looking for a pumpkin recipe to try-I nominate this one! I have been getting bombarded with one question lately, “when are you going to post pictures of your new kitchen?” We are home and our kitchen is functioning (I loved using our Thermador oven on Saturday) but it isn’t completely done. We have some odds and ends to finish up before it is ready to be viewed by all:) Until it is finished, I will be posting teaser photos. Here is one for you to enjoy today. Don’t you love our new white kitchen backsplash? That is all you get for now! I have yet to make my own granola bars! These look delicious!!! These look amazing! I love the combination of flavors! I can’t wait to see your new kitchen! You can never, ever, ever have enough pumpkin in the fall. And I love your kitchen. where did you get the containers and scoops?? Thanks Maria…that’s one of my favorite stores. Very dangerous to go there though. I spend WAY more than I mean to. Yay! Another great oats and pumpkin recipe! I can’t wait to try it! You never cease to amaze me with the amazing recipes you come up with! I LOVE the look of these. I didn’t think it could get any better than pumpkin granola – but it did! Wish I had on for breakfast this morning. ooo, wishing I had a few of these today, they sound incredible!! LOVE, love, love a kitchen with a white back splash! Can’t wait to see the rest! And boy do I wish that I had one of these little darlings to enjoy with my coffee right this very moment! good morning deliciousness! I would love to star my day munching on one of these. i love making homemade granola bars. i pre-shape mine and then when i bake them they spread. i may have to try it your way and see what happens. loving the pumpkin idea. they look scrumptious! These look very similar to what I buy from the store, but I bet they are a LOT tastier and healthier! Thanks for sharing, Maria and Josh! I will definitely give these a try sometime soon. Can you ever have too many pumpkin recipes? This one is definitely going in my to-make pile! yummy bars 🙂 the perfect little snack! … sounds like the kitchen is really coming together now!!!! I just made the granola yesterday so I can imagine how good these bars are! I saw you tweet about these – OMG, they look amazing! I’ve not made granola – but this is a reason to try. Pumpkin? YES! I have been thinking about these granola bars ever since you tweeted about them. They look fantastic and I will definitely be trying them. A great idea! Those granola bars look very addictive. Ooooh, those look delicious! Great idea! Looks delish, thanks for the link! 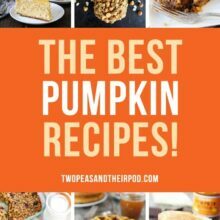 I LOVE all the pumpkin recipes!!! I’m in pumpkin mode too. These looks so delicious! Can’t wait to try this recipe. Oh, these look wonderful! I going to make these this weekend. Homemade granola bars are so much better than the store bought ones. This is such a fantastic recipe! I’ve never had a pumpkin flavored granola bar but they look absolutely delicious! Do you have anything for pumpkin oatmeal cookies? Here is my recipe for Pumpkin Oatmeal Chocolate Chip Cookies: https://www.twopeasandtheirpod.com/pumpkin-chocolate-chip-oatmeal-cookies/ Enjoy! You’ve done it again… definately bookmarking this one, too! Can’t wait to try it! You need to sell this to Quaker or Kashi or someone like that. I see a hole in the granola bar market and you have for sure just filled it. Yum, these look delicious! It’s spring down here but you have me craving pumpkin baked goods! These look awesome. I love the addition of pumpkin! Maria, I am continually amazed by your skill and creativity. These look positively wonderful. 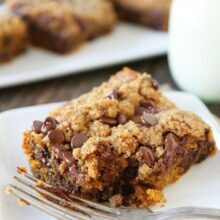 We bought granola bars the other day, one box of pumpkin and one box of chocolate chip and now I am kicking myself because I could have just made these! These sound awesome! Keep the pumpkin recipes coming! I make granola bars all the time for my kids. I am always drawn to new recipes to give them a try. I will definitely be trying these. They look amazing. 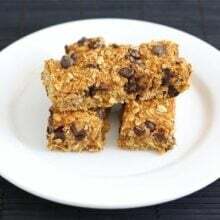 I just made granola bars for the first time last week and although they tasted great, they were a crumbly disaster (and they stuck to the pan!). Yours are beautiful, I’m definitely going to give this recipe a try! I’ve never made granola bars – but I keep thinking I really need to, especially for my little girl! And I am eagerly awaiting your kitchen reveal! Great idea! I’ve been kicking the idea around a lot lately too, but I love that I don’t have to figure it out for myself now. The boys love pumpkin and chocolate, so these should be a hit! These look amazing. We love pumpkin and granola bars so this is a keeper! I love this idea! I’m adding this to my list of things I want to make. I love granola bars. I LOVE these!! I have never made homemade granola bars, but have always wanted to. I definitely need to make these! Wow, these look delicious! I hope to be making these soon. WOW…I never thought to make Granola Bars! What a great idea! Thanks. oh wow–these look incredible! I was actually thinking of making pumpkin granola bars last week and couldn’t find a recipe so I was going to make up my own…but now I can’t wait to try yours! I’ve been wanting to make granola bars for the longest time! Adding in pumpkin just makes them sound even better. Bookmarking this! I can’t wait to see the finished kitchen! That’s so exciting. Your granola bars sound amazing! I might have to make these tonight. I really, really want to. No, no, no quitting on the pumpkin recipes! I love them, keep’m coming PLEASE!! 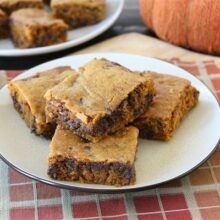 Loving the pumpkin recipes and these are a great healthy pick. okay just made these and eating one as i speak…LOVE THEM! My mom, Liz (Meal Makeover Mom), made your bars and I just tried one. It was great. I liked the texture and the taste. Loved them! Great recipe Maria! I can’t seem to get enough of pumpkin either. I love it! These granola bars look great! I still haven’t made your pumpkin granola but I plan to make it once I’m back home from our vacation. Maria – Loving these. 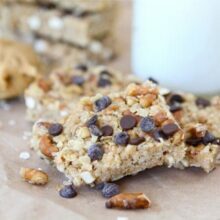 I’ve been looking for a granola bar recipe…and these are gluten-free to boot. Bonus! I hope you like the granola bars Nancy. I’ve been going crazy with the pumpkin baking too Maria. How can you not this time of year? It’s just so delicious 🙂 These look terrific – I’m adding them to my pumpkin baking list! What a GREAT idea! A portable form of pumpkin via the granola bar. This is pure genius. i love homemade granola bars! this is a fantastic use for pumpkin! 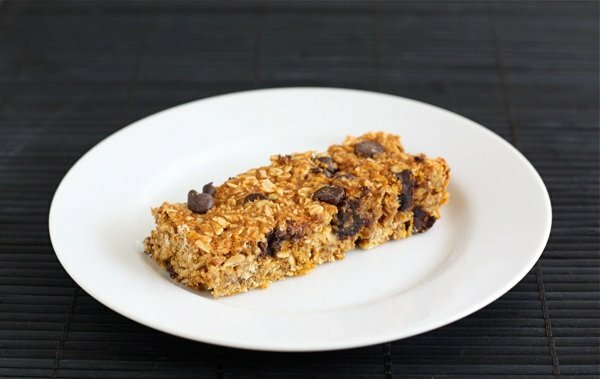 I have to try these – I love granola bars but have never made my own. Can’t imagine a better first try than with pumpkin! I haven’t made homemade granola bars in a while, and I’m not sure why. I love them. These might be the inspiration I needed. You can’t go wrong with pumpkin! I loved the pumpkin flavor with the chocolate chips. A great granola bar for fall! I’m just getting ready to make your pumpkin streusel muffins-scrumptious looking-and was wondering what to do with the other 2 cups of pumpkin from the can. Bingo-pumpkin granola bars! I have everything but the honey, can I leave it out or will that wreck it? I made these and they taste delicious! I do wish they were a little crispier though. 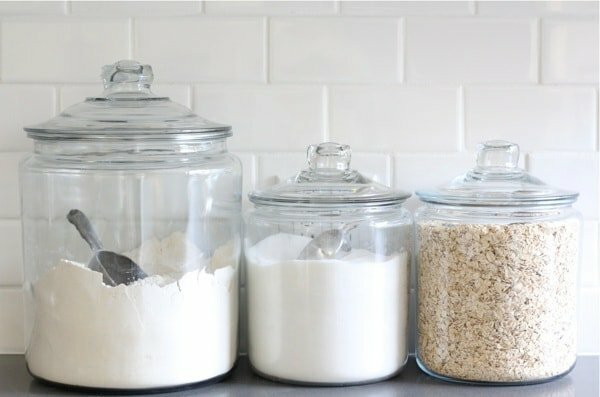 I used old fashioned oats, would instant rolled oats make a difference? Or maybe I just needed to bake them longer. Also, could you replace the applesauce completely with pumpkin to add to the pumpkin flavor? Thanks for the recipe! Try baking them a little longer. The pumpkin keeps them moist, do don’t under bake. My oven only took 30 minutes, but try 35-37 minutes. I haven’t tried them without applesauce, but I am sure it would work. Let me know if you try it! Ok, thanks! Just want to say again that they are delicious! Oh I love a good granola bar, these look great. We have to pack real food for our kids lunches and I think these will fit right in! Thanks for linking up to Just Another Meatless Monday! hooray for pumpkin! it’s one of my favorite terms of endearment and it’s a fine way to enhance some granola bars! Making granola bars has been on my to-do list for awhile. When I saw your recipe I had to try it immediately. They turned out great! The whole family loved them. A new favorite recipe. Thanks! Yay! Glad the whole family loved them! I will have to try butterscotch chips next time. Great idea! I’ve been wondering about your kitchen too. Can’t wait to see it! Wow these look delicious!! I know my family would love them. I am hosting a pumpkin link up on my blog on monday, hope to see you there. These were absolutely delicious! They are almost gone and I made them 2 days ago! GREAT recipe 🙂 Thanks for sharing!!! Yay! Glad you enjoyed the granola bars! We made these this weekend with sweet potatoes — yum! Thanks. I will have to try them with sweet potatoes. Great idea! Thanks so much for the wonderful recipe! I’ll be making these again and again. Oooo these sound really good but I find the combination of pumpkin and chocolate kind of strange so I might replace them with pumpkin seeds! I have tons of instant oatmeal…..could I use that and have them still turn out? I have never tried instant oatmeal, but you could try it. Let me know how they turn out! These are so good! But mine look nothing like yours. Yours look like they came out of a box. Mine? Well, let’s just say it’s more like picking up the crumbs. But still delicious. The house smells amazing and the “batter” tastes amazing. Can’t wait for the bars to come out of the oven. YUM! The recipe is a tad bit heavy on the chocolate chips, so I may cut back on those a little next time. I also think adding dried cranberries would be delicious. Thanks for the recipe! Ooo so glad I found these tonight. The itch to bake with pumpkin has begun. I’m making these this weekend! I made these today and they are really yummy! I don’t have pumpkin pie spice so I added about 1/8th tsp of ground ginger. These will be great for breakfast or snacks. Thanks for the great recipe! Great recipe! Just made it this week. Posted about it on my blog 🙂 Thanks!! I made these last night! Delicious! I can’t wait to try them with other things like peanut butter, Nutella and adding in a bit of vegan protein powder. I cut them into bars and put them into an air tight container. I plan on munching on these as a snack or as breakfast. I’d say the key to them not crumbling is to make sure they cool all the way. I cut mine partially and then flipped over on a wire rack to cool. Once cooled it was easy to break off the sections. I know it is hard once they come out of the oven but good things come to those who wait! LOVED this recipe! Tried it here (http://chubsandsmalls.blogspot.com/2011/10/pumpkin-chocolate-chip-granola-bars.html) for my in-laws, and they loved it, too! Yay! Glad everyone loved the granola bars! my kids love granola bars, this will be a nice addition to the mix. I bet the pumpkin is fantastic in these! cant wait to mix up a batch. Have you ever tried to make these using a muffin pan? I haven’t but I am sure they would work great in a muffin tin! These are awesome! I have tried over a dozen granola bar recipes and none were as good as these. I made them several times for my family with a couple of variations. Once with chocolate chips, and another time with cranberries, white chocolate chips and macadamia nuts. Much better than store bought. I have never made granola bars before but these are in the oven right now and they smell delicious! How would you suggest storing them? Do they need to be refrigerated? I always store them in the fridge so they will last longer. Just let them come to room temperature before eating. You can leave them on the counter if you wish. Enjoy! These sound yummy! How do you make the puree? I made this with my mom it was AWESOME! I made these today as my first attempt at granola anything. They came out delicious but slightly mushy – more like an oatmeal cookie texture than a granola bar. I only had 2 cups of rolled oats so I subbed the other 1 1/4 cups with steel cut oats, could that have something to do with it? Thank you for the recipe! What is the nutritional count on these? They are YUMMY! Do you happen to have how many servings this makes or WW points and/or nutritional information per serving? I could figure it out, but I thought maybe you may already know. Thanks! Do you think I can get away with making these in a 9×13? Or is that too big? I make these all the time! So happy for pumpkin season to be back! I made a couple batches last year to keep me satisfied with a newborn baby!